Wolfgang Hatz, the board member in charge of Research and Development at Porsche AG, who oversees the company’s motorsport activities, says that the company has not signed Mark Webber. “We can have perhaps some Formula 1 drivers in the future but it is not necessary,” he said. I was at Silverstone on Sunday and was told by an lmp driver (friend of mine) that it has been signed and is £2m a year for WEC with LM24 included. That also sounded fairly clear cut. I am sure the Imp driver knows more than the Porsche board member. Or the Porsche board member isn’t telling the truth? Perhaps an impish Imp driver. Joe, thanks for the heads up on two books: Adam Parr’s The Art of War – Five Years in Formula One, enjoyed it but glad I borrowed a copy. £25 was a bit steep for a book that can be read in just over an hour. Also Virginia Williams’ A Different Kind of Life – wow, what an inspirational Lady. Had trouble finding a copy but eventually bought one on ebay – very glad I did. An Imp driver! With all due repect to Bill McGovern and his contemporaries why would any of them have insider knowledge of Porsche dealings. Joe, surely you know that Imp drivers are the best-informed persons in the sport? I’m struggling to see the denial.. He might not know more, but he might know the same. The driver in question has lost a contract to webber as a result of the move. Said driver is also recently ex-F1. F1fan1998: About your quote – “The driver in question has lost a contract to webber as a result of the move. Said driver is also recently ex-F1.” There are NO ‘ex-F1’ drivers among the 10 current Porsche factory drivers. Of the 10 current drivers – up to four may change for the 2014 season which is the normal rotation the factory seem to go through. In fact the number on contract is at an historic high. Could Weber be hired? Sure… but not likely. Porsche don’t *need* a high profile driver in their group – it’s about THEIR cars, not the driver. Romain Dumas and Timo Bernhard (LMP2 RS Spyder experience) are the current development drivers for the new LMP1 car so expect each of those to head up two cars each (with others) with Pat Long partnered (Tandy?) in a third car for US marketing reasons. Porsche doesn’t *need* to be paying $2M (per year!) to a single ‘big name’ driver when they already have a stellar line up of current drivers along with the Porsche junior driver program in operation. No offense to Webber but his talents are not needed for Porsche to beat Audi. If the engineering is so questionable that ONE man behind the wheel in a multi car/driver team can make a difference, then they are in the wrong business. This report about Webber to Porsche was all about one German tabloid (Bild) trying to connect the dots between Webber’s current upset with Red Bull and the fact that he owns a Porsche road car. All of these stories seem to circle back to a purported Weissach visit that no one seems to have photographed or publicly witnessed. Where did Bild get it’s info from? His management? Silly season has started early. All very good points, but you have come to your own conclusion that I was talking about an existing Porsche driver. There’s plenty of ex-F1 drivers in WEC don’t you know, of which some are trying to get a Porsche contract in their back pockets for 2014 onwards. The salary figure is not really relevant to this conversation. What do you think McNish is taking from Audi each year for example? Perhaps this unnamed driver was in contention for a Porsche factory seat until Webber’s alleged deal went through? its not necessarily Porsche who would be paying and racing teams are always interested in have another revenue stream. Given Mark’s pre-existing ambassador relationship with Porsche though, I think it’s odds on that he’ll be joining the programme when he does eventually leave F1 though. Personally I think he’ll have one more season after this one in F1, which coincidentally allows the Porsche programme to correct any first year problems they will encounter. Come on Joe, give credit to the source of the quote and where you read it. Where did I read it? I’m guessing Joe IS the source of the quote and he spoke to the gentleman on the phone… Joe actually talks to people, you know. No, I was not the source in this case. However board members at Porsche generally do not tell bald-faced lies. It is not in their interest to do so. I came here to say how much it amused me that you gave this story all the words that it deserved, one of the many things I enjoy about your writing. But I can see that there are already people wanting more, and perhaps more comments waiting approval. I’m sure the board member does know more than the Imp driver. But… the Imp driver has no reason to fudge answers at this stage, unlike the board member. why should one assume that what was told to the so called imp driver is the true reason this was not chosen to take part in that important (truly) team? Hmmm… what he said was that there was a testing program in place and that Webber would not be involved. Which makes sense, as Webber has an F1 car to drive for most of this year. So could the two could both be true? Webber has signed for Porsche (though it does seem early in the year) and he will not be involved in the current program. Sounds like a non-denial to me, to be honest. If anything, he’s leaving a very wide-open door for Webber to go through. And how many people were there on the grassy knoll in Dallas? Fortunately, Paddy Lowe is not a large man. But I suppose there’ll be a much wider space opening up soon, so everyone in there will get an extra inch or two. so where did this rumour start………there could be a conversation going on which would make sense as Webber has to be asking himself the question of where to if Red Bull do not resign him, also with his previous experience with Mercedes in sports cars it might help Porsche……………..
Joe – considering all that is going on at RB it is highly unlikely that Webber will stay. He is also getting older so not really a #1 in any other teams. The question… Where to from here for our beloved Australian? I dunno about Ferrari now Joe. Massa seemed to have upped his game, at least for now. Although I still say Webber is a better driver. Maybe a move to Lotus if Kimi goes to RB. I know Eric is a fan of his. Would he want to risk Lotus though? New regs and a smaller team could be ify. If Perez fails to improve this year, maybe McLaren beside Button. It would be a good pairing. I don’t know how much clout Ron still has there but he likes Webber. Then, he dislikes Flav in equal measure. Just my thoughts. Next year might probably even out the top competition more with new engines, who knows. I hope so. Didn’t Mark say he likes the open relaxed less political environment of Lotus? Ciaron Pilbeam is there now too. How long is Perez’s contract at McLaren meant to be? One year, with possible extensions. Such a theory is highly speculative, but isn’t entirely without logic. Yes Jem, it is speculative. Webber has also been quite critical of McLaren in the past too. Who knows what will happen in the parallel world of F1. I am sure he would like the no number one approach at McLaren but would he like the corporate nature of the team?.Jenson is no chicken either so possibly McLaren need a younger driver even if Perez doesn’t work out. I see that Martin Whitmarsh is piling on the pressure already. I would love to see Mark at Ferrari but he surely wouldn’t want to be number two driver – but maybe he needs a pension top up? Extensive experience with multiple teams and operating styles. Perez may rediscover the form which impressed us all for 18 months. Macca need to ditch Perez and get Hulkenberg in pronto. I watched some onboard of him at Spa when it was raining and I’ve never seen car control like it. Plus he’s fundamentally better than Perez. 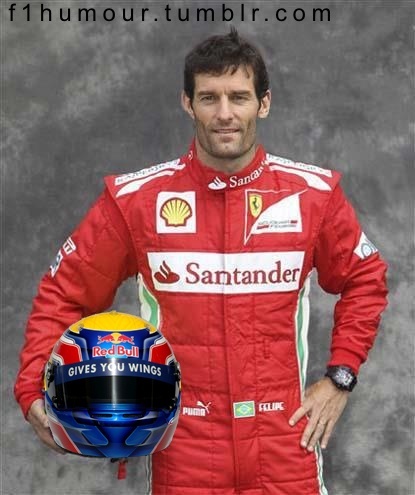 If Webber has signed for Ferrari next year , it would be wise for them to keep it firmly under their respective hats . Not helping Vettel (but not necessarily hindering) could be an asset to Ferrari in the closing stages of the Championship . If word gets out he’ll surely be on his ear before the season end . RB would most likely pay him off and plug in whoever’s got next . The Porsche rumour in my opinion is a possible diversion . Perhaps this is Pollyannish, but surely a driver’s contract with a manufacturer (Webber/RB) would include a clause either requiring him to disclose the existence of any sort of financial/contractual relationship with a competitor or forbidding such a thing in the first place? Thus he was suspended, back in the good old days when team bosses had authority, eh Christian? why? they are not faster than rb and he will be a no.2 there as well. in addition, massa has upped his game, so why would ferrari get rid of him now when they didn’t during his slump? Webber and Alonso both tweeted a pic of them having dinner over night entitled “dinner with friends”. I’ll put a tenner on Webber doing at least one year with Ferrari next year. An image similar to this one ran in the most recent GP+ next to one of the articles on the RBR situation. It mad me look twice! If you’re** going to photoshop Webber into a Ferrari race suit, why not switch the Red Bull logo on the helmet for Santander? ** = the generic “you” in the sense of “one”, I know you (Dave in NZL) didn’t make it. Bild are saying it’s been leaked from the Webber camp. I say Helmut Marko has more to gain by getting scuttlebutt like this out to try and get people talking more about Webber and less about Vettel, or just because Marko is an arse. Either or. Don’t spoil a good rumour. What Hatz was actually quoted as saying was “there is a TEST PLAN and for sure Mark Webber is not part of them [sic]”. He may well not be part of the TEST PLAN. Mark could well have signed a contract to race, not develop, and Hatz would not have been lying. Yep. As I said on twitter, either me or lots of other people will look pretty silly, but I say it’s rubbish. “We can have perhaps some Formula 1 drivers in the future but it is not necessary.” – is assuredly not clear cut. As a statement, it leaves as many holes as a Swiss cheese. The adverb ‘perhaps’ softens the meaning and whilst it may not be ‘necessary’ for Porsche to hire a current Formula One driver they might well find it desirable so to do. As to ‘the future’, well that starts right now, so Webber could be signed next week leaving Herr Hatz having gone nowhere near telling a porky pie. Why would he want to quit F1 when he’s still as fast as anyone out there? Because Le Mans is bigger than F1. If Perez doesn’t cut the mustard this season, then McLaren might fancy a season or two with Webber in the team? Very fast, very experienced and with plenty of Red Bull knowledge to benefit from. I suspect there have been discussions between Webber’s management and Porsche about a Porsche drive if Webber doesn’t find a drive in one of the top F1 teams next year. If I was Webber and had the option of being a number 2 driver at Red Bull, or a number 2 driver at Ferrari, I would take the Ferrari option. Webber might find that his driving improves at Ferrari, as he doesn’t have the added stress of Red Bull management and Vettel. Of course a number 1 driver role in one of the top teams would probably be his preferred option. Nick signed with Rebellion (P2) way back in January, (before all this Webber/Red Bull angst). The problem that a lot of commentators in this thread have is that Mark doesn’t see himself as a number 2 driver. That might be the reality behind the scenes thanks to RBR politics, but I don’t see Mark accepting that in his next move. That goes against his attitude. Renault might be an option to replace Grosjean. Radio Le Mans is claiming that the deal is already done. Joe, this is story is being reported quite widely at the moment. Obviously you think it is untrue but I’d be interested to hear your thoughts as to why this story has come about? Is it someone within Red Bull trying to destablise Webber or is it just a case of Chinese whispers with little foundation? Those saying he won’t go back to sports cars are wrong. He tweeted last year that he would love to return someday, funnily enough he said preferably with Porsche. An interesting side not about Mclaren: Haug was actually heavily involved with the Merc Le Mans team when Webber and his co driver flipped the car. Webber said a few years later that if Haug had much influence at McLaren back then, Webber would’ve have been straight into the F1 team. Webber would be a good fit at McLaren, Ferrari or Renault. I fear for the driver that is Vettels #2 next year if they don’t come from the junior team. I think it is just a story but has had coverage because of what happened. If the Webber-Porsche deal is not true, a lot of people are going to look like idiots. This is pretty widely reported at this point. It was even announced during the 6 Hours of Silverstone as soon as it went on the air. If it is true, obviously anyone working for Porsche is going to deny it until it’s time to make the announcement. I suppose only time will tell what the truth is. Personally, I think Webber would be a fool to go to Ferrari and be a number two driver again. Webber is good enough to be a number 1 driver, and I believe if he were given fair treatment at Red Bull, he might have a championship or two by now. Call me crazy, but I don’t believe Vettel is much better than he is, if at all. If I were Webber, there is only one spot I would accept in F1 next year, and that is to be Button’s teammate at McLaren where he can get fair treatment. Renault could be a good choice as well, but would he be number two to Raikkonen? Let’s throw in another option: this year Red Bull has been signed as sponsor to the successful V8 Supercars team Triple 8 (a.o. 4 drivers titles in the last 5 years). Why not have Mark Webber return to Australia next year, to compete in the V8 Supercars, sponsored by Red Bull? Of course I have no prove whatsoever, but the thought of seeing Webber at Bathurst makes me smile. A lot. Has Mark himself came out and denied these rumors himself? I have not read anywhere. Q: There have been many rumours about your future. What’s the truth about these? MW: I have made it clear in China that I have not made any plans of my future and you can ask anybody in my camp if we do know what I am doing next year – we don’t! It’s been rumoured for more than six months now. If it isn’t already a done deal, it is very close to being done. Apparently Mark is to talk to Mateschitz on Monday in private. Irrespective of whether the Porsche rumour is true or not, Webber must surely have decided to leave RB. He’s certainly not holding back on his lack of love for Marko. Run to the last few seconds of this video for an example.